Note: The night before, start by soaking the beans overnight in a bowl of water to cover the beans by two inches. If the weather is hot, place the bowl in the refrigerator to prevent any fermentation. 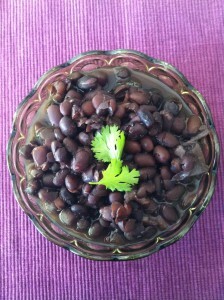 In the morning drain the beans, and rinse with cold water. 3. In a 4 quart pot add the olive oil over medium heat, once shimmering, add onions and garlic. Cook until fragrant. Add the water. Boil the quart of water, DO NOT add the salt. Salt, and any acids can toughen beans, so do not add them until the end. 4. Once the water is boiling reduce heat to medium low, add the beans. Reduce to a simmer, cover, and cook for at least 2 hours. Each batch will be different, so be sure to check the doneness of the beans before you remove from the heat, add water if needed during the cooking. 5. Once the beans are done, add the pepper and salt. Stir to combine, turn off heat. Serve with cilantro family style or in individual bowl. Try this Black Bean Mango Bowl recipe!